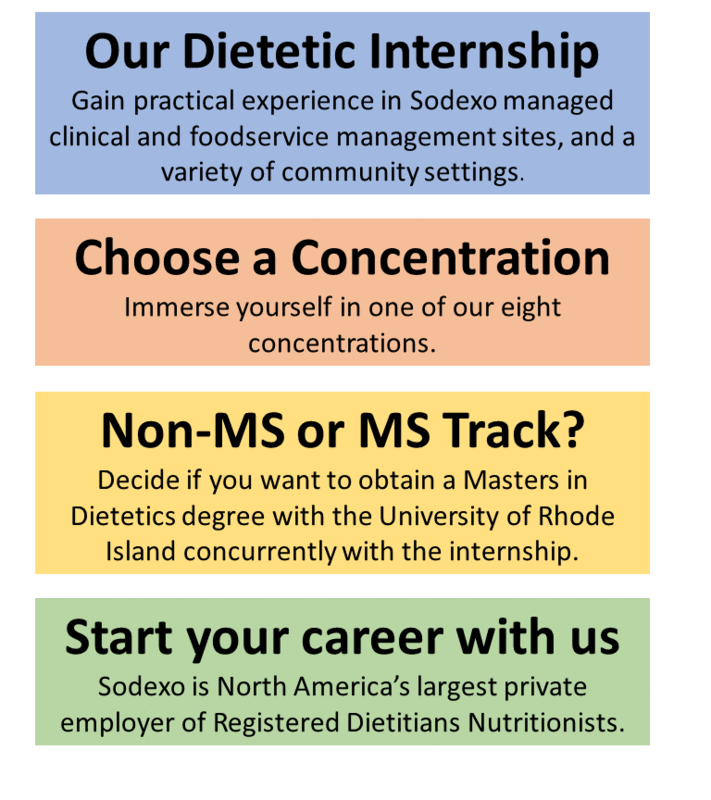 Sodexo, North America's largest private employer of Registered Dietitian Nutritionists, proudly offers a Dietetic Internship, where future nutrition professionals can continue their dietetics education in diverse and rewarding ways. The internship seeks to attract talented interns who wish to pursue a career with Sodexo after completing the internship. Candidates who are selected for our internship may choose to complete their 32-hours-per-week* supervised practice experience in one of 12 regions throughout the United States. Once accepted to the internship program, internship faculty arranges the clinical and foodservice management rotation placements within Sodexo-managed accounts. Accepted interns may elect to apply to an accelerated Master of Science in Dietetics program through our partnership with the University of Rhode Island, Kingston, Rhode Island. The master’s program is 100% online. Various geographical practice regions, the optional Master’s Degree track, and an exciting variety of concentrations including an international rotation through our leadership concentration, meet the needs of most interns, providing the flexibility to pursue specific areas of interest. *Will you need to achieve your competencies in more or fewer hours per week? Once accepted, talk to your region’s director to explore ways to reasonably individualize your internship experience. Students who have or will be completing a DPD program accredited by the Accreditation Council for Education of Nutrition and Dietetics (ACEND) and receiving a DPD verification statement are eligible to participate in this program. Interns who successfully complete this internship are eligible to sit for the Commission On Dietetic Registration (CDR) national registration examination to become a Registered Dietitian Nutritionist. Many states have licensure or certifications. Contact local Academy of Nutrition and Dietetics chapter for more information.